The Institute of Cultural Affairs (ICA) is a non for profit organisation, that focusses on advancing human development worldwide. They developed the Technology of Participation as an integrated series of methods and tools for facilitation. They are suitable for use in a variety of facilitation and extension settings. ICA also offer training and certification in facilitation. 1. 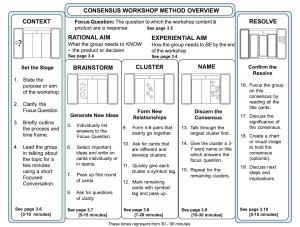 The ToP Focused Conversation method – utilises a four level sequence of questions, to move a group’s discussion from the objective information, through to their initial responses and interpretations, to then develop clear conclusions. It is known as the ORID method. Context – the background to what is at hand and the outlining of the process that is to be followed. Victory – identifying what success will look like. Current reality – what is the current situation, including what resources are available. Commitment – identifying and stating what each group member or stakeholder will contribute and deliver. Key actions – what are the key tasks and implementation steps that need to be completed. Calendar – the placing of key tasks or implementation steps on an action timeline. Assignments – allocating roles to group members. Including who will lead and where does accountability and responsibility for each key task or implementation step lie. Resolve – confirming the group’s plan and their level of commitment and motivation to implementing it. 4. ToP Historical Scan or “Wall of Wonder” – this is a group reflection tool, that enables a group to review their history and progress. Through the process, they identify events that have taken place and place them on a timeline. The process helps them reflect on their history (where they have come from) and current strategic environment, what they have learned, each other’s perspectives and how they are positioned to move into the future, (where they want to go). It is particularly useful at getting group members on the same page and with the same level of understanding of what has occurred. It is also great for group members who have not participated in every event, or who are new. The end result is a detailed story created by the group. 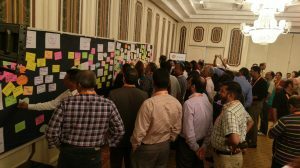 It uses the ToP Consensus Workshop Method and the ToP Focused Conversation Method, to create and discuss a “wall of data” from the group. It starts with a wall that has a chart upon it, with a timeline across the top of the chart. The timeline reaches back to a point in time, that is a relevant for the group to review from. It may be from the start of the group, or the start of a particular project or initiative. Firstly they each identify events that have occurred over the time period. Which are then placed on cards and added to the wall at the relevant step on the timeline. They then reflect on how they felt about each event, what they learned from them and where the key points of transition to the current situation were. They then identify whether there are any series of events, that form “chapters” in the story of the group, project or initiative they are exploring. As a result of their review, with that shared and explored context, they then consider what implications it has for the future. 5. ToP Strategic Planning – through this process a group develops their strategic actions and an action plan. It starts with them developing a shared vision. It also looks for any contradictions that may inhibit progress, as the group identifies their strategic actions and develop their action plan. The flow or sequence of the steps. The use of the ToP methods to involve the group. The emphasis on implementation as part of the process. Mapping out the practical vision. Drawing up the implementation timeline. The five methods listed above, can be mixed and matched to meet the needs of specific groups and their individual situations. As each group is different, mixing and matching enables things to be tailored to ensure effective outcomes for each group. The video below, published by the Kolbe Company in 2016, provides a good description of the Focused Conversation Method and the Consensus Workshop Method, which are integral to nearly all of the ToP facilitation processes and tools. The Institute of Cultural Affairs. Click here. Spencer, L. (1989) Winning Through Participation. Kendall/Hunt publishing company. ISBN 0-8403-6196-3.